King Solomon created the wealthiest and most powerful central government the Hebrews would ever see though at high cost. After his death between 926 and 922 BCE, the ten northern tribes refused to submit to his son, Rehoboam. This created two states Israel in the North with Samaria as their capital and Judah in the south with their capital in Jerusalem. These kingdoms remained separate states for over two hundred years. In 722 BCE, the Assyrians conquered Israel. This policy forced many native inhabitants to spread throughout their empire so conquered territories remained pacified,. They almost always chose the upper and more powerful classes as they had no reason to fear the general mass of a population. They would then send Assyrians to relocate in the conquered territory. These became the Samaritans. The ten tribes of Israel became known as the Lost Tribes who ‘disappeared’ from history. Since them links have been discovered and desscendents have been found. Between 597 and 586 BCE the Babylonians conquered Judah and exiled the wealthy, and craftsmen to Babylon. Ordinary people were allowed to stay in Judah. This deportation was the beginning of the Exile. Those who wanted towere allowed to return in 538 BCE. Some returned and some stayed. he Jews' religious identity had been tied to their homeland. The exiles brought about a number of significant changes to the way Judaism was practiced. Many of these changes still affect Judaism. Jewish religious life revolved around the Temple in Jerusalem. Expulsion meant important aspects of Jewish religious life -- most notably animal sacrifice -- could only be performed at the Temple in Jerusalem. Lacking both a temple and the ability to go to Jerusalem meant changes were needed to retain their cultural and religious identity. The result was the rise of the synagogue among the Jews dispersed throughout the Babylonian Empire. The focus shifted from animal sacrifices to the study and teaching of the Torah -- the Jewish Bible -- which became the focal point of synagogue worship. According to the Old Testament Jacob had twelve sons and at least one daughter by two wives and two concubines. After the Exodus from Egypt under Moses the Jews under Joshua conquered Israel which was divided between the tribes. The tribes of Levi and Simeon only received cities with surrounding open space. Jacob elevated his grandsons Ephraim and Manasseh, the two sons of Joseph by his Egyptian wife Asenath, to the status of full tribes so replacing the single Tribe of Joseph. Israel in the north had a swift succession of ten dynasties. In 721 BCE it became an Assyrian province and its population was deported. They are now called the ‘Lost Tribes’. Details of Groups claiming descent from the Lost Tribes are shown below. Jerusalem, the capital of the Kingdom of Judah in the south continued until 587/586, when it was conquered by the Babylonians who destroyed it. Later, the Persian kings permitted captive Jews to return from Babylonia, rebuild their temple and the walls of Jerusalem. They are the ancestors of modern Jewry. The experiment with the opulence and power of the great eastern kingdoms ended in disaster for Israel. King Solomon created the wealthiest and most powerful central government the Hebrews would ever see, but he did so at an impossibly high cost. Land was given away to pay for his extravagances and people were sent into forced labor into Tyre in the north. When Solomon died, between 926 and 922 BCE, the ten northern tribes refused to submit to his son, Rehoboam, and revolted. 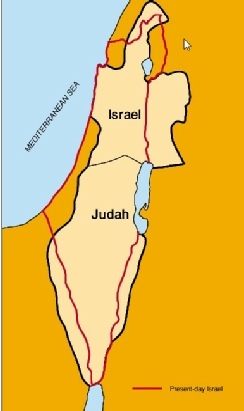 From this point on, there would be two kingdoms of Hebrews: in the north - Israel, and in the south - Judah. The Israelites formed their capital in the city of Samaria, and the Judaeans kept their capital in Jerusalem. These kingdoms remained separate states for over two hundred years. The history of the both kingdoms is a litany of ineffective, disobedient, and corrupt kings. When the Hebrews had first asked for a king, in the book of Judges, they were told that only God was their king. When they approached Samuel the Prophet, he told them the desire for a king was an act of disobedience and that they would pay dearly if they established a monarchy. The history told in the Hebrew book, Kings, bears out Samuel's warning. The Hebrew empire eventually collapses, Moab successfully revolts against Judah, and Ammon successfully secedes from Israel. Within a century of Solomon's death, the kingdoms of Israel and Judah were left as tiny little states - no bigger than Connecticut - on the larger map of the Middle East. As history proved time and again in the region, tiny states never survived long. Located directly between the Mesopotamian kingdoms in the northeast and powerful Egypt in the southwest, the Hebrew Kingdoms were of the utmost commercial and military importance to all these warring powers. Being small was a liability. When they conquered Israel, they forced the ten tribes to scatter throughout their empire. For all practical purposes, you might consider this a proto-Diaspora ("diaspora"="scattering"), except that these Israelites disappear from history permanently; they are called "the ten lost tribes of Israel." Why this happened is difficult to assess. The Assyrians did not settle the Israelites in one place, but scattered them in small populations all over the Middle East. When the Babylonians later conquered Judah, they, too, relocate a massive amount of the population. However, they move that population to a single location so that the Jews can set up a separate community and still retain their religion and identity. The Israelites deported by the Assyrians, however, do not live in separate communities and soon drop their Yahweh religion and their Hebrew names and identities. One other consequence of the Assyrian invasion of Israel involved the settling of Israel by Assyrians. This group settled in the capital of Israel, Samaria, and they took with them Assyrian gods and cultic practices. But the people of the Middle East were above everything else highly superstitious. Even the Hebrews didn't necessarily deny the existence or power of other peoples' gods—just in case. Conquering peoples constantly feared that the local gods would wreak vengeance on them. Therefore, they would adopt the local god or gods into their religion and cultic practices. Within a short time, the Assyrians in Samaria were worshipping Yahweh as well as their own gods; within a couple centuries, they would be worshipping Yahweh exclusively. Thus was formed the only major schism in the Yahweh religion: the schism between the Jews and the Samaritans. The Samaritans, who were Assyrian and therefore non-Hebrew, adopted almost all of the Hebrew Torah and cultic practices; unlike the Jews, however, they believed that they could sacrifice to God outside of the temple in Jerusalem. The Jews frowned on the Samaritans, denying that a non-Hebrew had any right to be included among the chosen people and angered that the Samaritans would dare to sacrifice to Yahweh outside of Jerusalem. The Samaritan schism played a major role in the rhetoric of Jesus of Nazareth; and there are still Samaritans alive today around the city of Samaria. "There but for the grace of god go I." Certainly, the conquest of Israel scared the people and monarchs of Judah. They barely escaped the Assyrian menace, but Judah would be conquered by the Chaldeans about a century later. In 701 BCE, the Assyrian Sennacherib would gain territory from Judah, and the Jews would have suffered the same fate as the Israelites. But by 625 BCE, the Babylonians, under Nabopolassar, would reassert control over Mesopotamia, and the Jewish king Josiah aggressively sought to extend his territory in the power vacuum that resulted. But Judah soon fell victim to the power struggles between Assyrians, Babylonians, and Egyptians. When Josiah's son, Jehoahaz, became king, the king of Egypt, Necho (put into power by the Assyrians), rushed into Judah and deposed him, and Judah became a tribute state of Egypt. When the Babylonians defeated the Egyptians in 605 BCE, then Judah became a tribute state to Babylon. But when the Babylonians suffered a defeat in 601 BCE, the king of Judah, Jehoiakim, defected to the Egyptians. So the Babylonian king, Nebuchadnezzar, raised an expedition to punish Judah in 597 BCE. The new king of Judah, Jehoiachin, handed the city of Jerusalem over to Nebuchadnezzar, who then appointed a new king over Judah, Zedekiah. In line with Mesopotamian practice, Nebuchadnezzar deported around 10,000 Jews to his capital in Babylon; all the deportees were drawn from professionals, the wealthy, and craftsmen. Ordinary people were allowed to stay in Judah. This deportation was the beginning of the Exile. The story should have ended there. However, Zedekiah defected from the Babylonians one more time. Nebuchadnezzar responded with another expedition in 588 BCE and conquered Jerusalem in 586 BCE. Nebuchadnezzar caught Zedekiah and forced him to watch the murder of his sons; then he blinded him and deported him to Babylon. Again, Nebuchadnezzr deported the prominent citizens, but the number was far smaller than in 597 BCE: somewhere between 832 and 1577 people were deported. The Hebrew kingdom, started with such promise and glory by David, was now at an end. It would never appear again, except for a brief time in the second century BCE, and to the Jews forced to relocate and the Jews left to scratch out a living in their once proud kingdom, it seemed as if no Jewish nation would ever exist again. It also seemed as if the special bond that Yahweh had promised to the Hebrews, the covenant that the Hebrews would serve a special place in history, had been broken and forgotten by their god. This period of confusion and despair, a community together but homeless in the streets of Babylon, makes up one of the most significant historical periods in Jewish history: the Exile. This period saw the last high-point of biblical prophecy in the person of Ezekiel, followed by the emergence of the central role of the Torah in Jewish life. According to many historical-critical scholars, the Torah was redacted during this time, and began to be regarded as the authoritative text for Jews. This period saw their transformation into an ethno-religious group who could survive without a central Temple (see Ezra and the Compilation of the Pentateuch). This process coincided with the emergence of scribes and sages as Jewish leaders. Prior to exile, the people of Israel had been organized according to tribe. Afterwards, they were organized by smaller family groups. Only the tribe of Levi continued in its temple role after the return. After this time, there were always sizable numbers of Jews living outside Eretz Israel; thus, it also marks the beginning of the "Jewish diaspora", unless this is considered to have begun with the Assyrian Captivity of Israel. would exclude many of them . The Falashas = Lake Tana, Ethiopia. The Samaritans of Nablus (Shechem). * comprises a team of academics, educators and rabbinical figures who reach out to “lost Jews” and assist them in coming to terms with their heritage and identity in a spirit of tolerance and understanding. * extends a helping hand to all members of our extended Jewish family and to all who seek to rediscover or renew their link with the people of Israel. • Jews from the Amazon who were descendants of assimilated Moroccan Jews who came as traders. • San Nicandro. An Italian community who converted to Judaism. Today most of them live in Israel though San Nicandro still a women's community. Kulanu is a network of people with a variety of backgrounds and religious practices. They do not proselytize: groups and individuals ask for their help; they are not sought out. Kulanu is involved with several "developing" Jewish communities around the globe that are not yet recognized by all of world Jewry. Some of these groups are returning to long-forgotten Jewish roots. Others have embraced Judaism on their own, often in complete isolation. In either case, Kulanu helps supply educational materials, scholarships, Jewish ritual objects and prayer books, teachers, and rabbis. The communities benefit by forming closer ties to the world Jewish community, and mainstream Jews benefit as they are reminded of the richness of their own religion. Below is a list of "developing" Jewish communities as well as a variety of other Jewish communities around the world. As the oldest member of Sinagoga Ner Tamid del Sud -- The Eternal Light of Southern Italy, Mario is known to everyone as Zio (Uncle) Mario. At 84 years old Zio Mario has discovered and embraced his Jewish roots and is now a regular participant in his mountain top congregation made up primarily of B'nei Anusim, or Crypto-Jews who have returned to their ancient Jewish traditions. 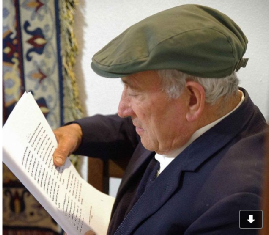 Thanks to Kulanu's efforts the Jewish communities in Italy have been able to receive three donated Torah scrolls - one for Ner Tamid del Sud in Serrastretta, Calabria, the first active synagogue in southern Italy in 500 years since Inquisition times. Two additional scrolls, which were shipped to Italy thanks to Kulanu donations, will now serve a new chavurah on the island of Sardinia and another in the region of Puglia. But those in Italy's remote regions are most grateful for the siddurim (Shabbat prayer books) and machzorim (High Holy Day books) that Kulanu's investigatore have found via donation and shipped to Italy as well. The 12 tribes that founded Israel.